I wrote a post some months back (July 2016) titled ‘The River Rouge – A divergent legacy’. If you haven’t read it, then it is necessary context for this post. I replied to Andrew’s comment and promised that I would add an addendum1…and then, as is usual, life carried on and time flew by. It is now, in this quieter Christmas/ New Year period that I realise that I have a hole to plug. My original post, whilst (in my view) highly positive of what Henry Ford achieved, used the enduring “you can have any colour you like, as long as its black” line. I used this as the strap line to observe that “[Ford’s] manufacturing process was not designed to handle variety”, as explained in separate books by H. Thomas Johnson and Mike Rother. My post then went on to contrast two very different approaches to handling the variety conundrum. He went on to suggest that “The Model T was produced with tremendous variety – far more than a modern car”. The early years (1908 – 1914): From cross-checking a number of Ford related websites, it would appear that the Model T was available in a small variety of colours during its early low-level production years (grey, green, blue and red). The volume years (1914 – 1926): This period corresponds to breakthrough improvements in producing at scale (and reducing the price)….and the only colour available was black. Reference is made across a number of sources that black paint was used because its fast-drying properties aided speedy production. Other reasons suggested are the cheap cost of black paint, its durability and ease of reapplication (e.g. when repairing). “Alfred Sloan [General Motors] began to offer inexpensive Chevrolets with amenities that the Model T lacked…..the market began to shift…styling and excitement suddenly counted to the customer. But Henry Ford refused even to consider replacing his beloved Model T…only one person persisted in warning him of the impending crisis: his son, Edsel…it was the first of many arguments that Edsel would lose. Body styles: Andrew’s comment usefully provides a link to an image showing a number of different Model T body styles, though I note that the title refers to 1911 which sits within the ‘early years’ pre-mass production period. The chassis: The Model T Ford was made up of the chassis (see title picture of this post) and then a body connected on to it. From what I have read (including Ford’s words), the key point about the Model T Ford was that the chassis ‘moving down the line’ were all the same. Sure, they would differ over time as the design was (regularly) improved, but not ‘in the line’. I find the picture below quite interesting – it shows2 a long line of Model T chassis waiting for a body (of differing styles) to be lowered on to it from a side process. Note the overhead rail coming in from the right. Factory Bodies: Yes, I can see that different bodies were available – as can be made out from examining the above picture – but there was a limited range of standard designs (e.g. the Tourer, Roadster, Coupe and Sedan3). Aftermarket ‘engineering’: You can come across all sorts of weird and wacky looking vehicles all around the world that have been built on a Model T chassis. This is unsurprising given the sheer volume (and market share) of Model T’s that were out there. A fair bit of ‘reconfiguring’ occurred, with owners hacking the car apart and customising it for their own needs. Many specialist aftermarket companies sprang up to perform conversions, even maturing to selling prefabricated kits for specific purposes, such as tractors. If you want a laugh at the sorts of conversions carried out then have a look at some of the images here (including a tank, a camper van…and a church!). So, yes, I do need to correct my previous post’s implication that you could only ever buy a black Model T, and that one Model T was exactly the same as any other. There was some variety, but does that mean Henry Ford had built a manufacturing process specifically aimed at handling this? And so I move on to…. An underlying philosophy of Ford’s tremendous production success was a standard product (i.e. the opposite of variety)…which nearly became his undoing and set his organisation onto a path of catch-up with General Motors from the late 1920s onwards. Toyota (learning from Ford) carried on in the direction of flow and worked out methods of handling variety in the line…thus achieving great things. Andrew’s comment on my original post provided me with the impetus to learn some more. …I pondered what all of that lot meant. i.e. it is in the act of attempting to explain something to others (e.g. via a post) that we can truly learn. 1. Writing an Addendum: I am mindful that a number of you may have read my original post but not seen Andrew’s comment or my reply. So, rather than allowing this to remain somewhat hidden, I thought it only right (and respectful of Andrew’s fair and useful comment) to elevate my response* to a further post. 2. 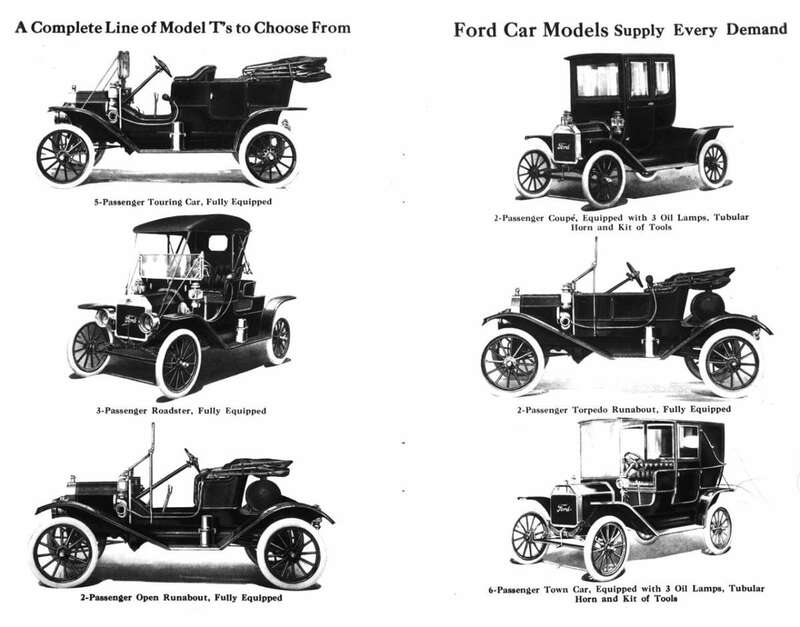 Using photos: I am mindful that Ford’s production processes changed all the time and I have been warned to be careful when using a black and white picture of Model T production methods – such a picture shows how it worked at a point in time…and could easily have changed radically very soon afterwards! 3. Body Styles information taken from http://www.fordmodelt.net/model-t-ford.htm. It shows that each of the main body styles evolved over time e.g. the Touring car went from 2 doors from 1909, to 3 doors from 1912 and then 4 doors from 1926. …well, about 100 years ago in America…there was a visionary man who led society through a monumental technological disruption – his name was Henry Ford – and he and his organisation changed the world through his desire to ‘democratise the automobile’. His success in putting the internal combustion engine on wheels devastated the ‘technology’ it replaced – the horse – and its many related industries (stables, horse feed and bedding, saddleries and tack shops, blacksmiths and farriers,….) although, on the plus side, it dissolved the huge problem of ever increasing amounts of horse manure pilling up on city streets! We talk about modern technological disruptions, like the mobile phone or internet, happening quickly (in years) but we should reflect that profound technological shifts can occur pretty swiftly, whatever the age. Okay, so Henry Ford was on the right side of a technological disruption…but, whilst this was necessary, it was much more than luck that made the Ford Motor Co. such a success2. Henry was fanatically clear that a business is only there because of the people that buy its products and services. Without them it wouldn’t exist and, as such, the customer (the public, society) is the point. Full Stop! This is so much more than the trendy “customer centric” mantra, in which we are usually shown a lovely circle with the customer conveniently arranged in the middle BUT, and this is the problem, all the other ‘conventional thinking’ management orthodoxy is retained around the outside3. “The true course of business is to follow the fortunes and pursue the service of those who had faith in it from the beginning – the public. If there is any improvement [in the quality of the service] let it be made without question, for whatever the capital cost, it was first the public that supplied the capital. That is the true course for good business to steer, and it is good business, for there is no better partnership a business can enter than a partnership of service with the people. Everything Ford did was with the customer at heart i.e could he provide the public with a cheaper car and yet also make it better than the ones he made yesterday? If he could do this, he knew that customer demand would continue to rise and profitability would be the least of his worries. ‘Customer, customer, customer’ provides growth and profitability – THAT WAY AROUND. To make it cheaper and better for the customer, Henry was obsessed with constantly studying, experimenting and improving the process – through fanatical cleanliness and maintenance, ever deeper removal of waste (transportation, movement, scrap…), re-use of anything and everything, in-sourcing wherever possible, constant technological breakthroughs, decentralisation to where the work should be…and so on4. And Henry didn’t just think about his automobile customers, he thought about the whole system (society) because he realised that it was all really one and the same thing. This led him into all sorts of interesting ventures that supported, and enabled, the core purpose. In short: THE foundational ‘thing’ that made the Ford Motor Co. such a huge success was that Henry truly believed that his master was the public. And so we move from customers to employees (the worker). The ‘wage motive’ was Henry’s phrase for his philosophy that “one’s own employees ought to be one’s own best customers.” If the workers truly prosper then they will love, buy and advocate for the products (e.g. cars) they make…which will create an ever-improving product, a superb reputation and expanding customer demand…which enables the workers to prosper – and off we go round the circle. Now, Henry was no Saint – he was a man of his times – but he wanted to do the right thing. Significantly, he learned from his early worker experiences and saw that the best, and only logical approach, was for his system to work with, and for, the worker, not against them. He paid them high wages (far higher than they could receive elsewhere), provided regular employment (replacing the uncertainty of casual labour with steady work), reduced the standard working week to 8 hours for 5 days, insisted that Sunday was a day off for all, and provided them with excellent working and living conditions. Any worker that wanted more than manual repetitive work was given the chance to better themselves through training and increased responsibilities. This is not to say that money and profits are not necessary in business. Business must be run at a profit, else it will die. But when anyone attempts to run a business solely for profit…then also the business must die, for it no longer has a reason for existence…. A business cannot serve both the public and the money power. Money put into business as a lien on its assets is Dead money, its main purpose becomes the production of payments for the owners of that money. The service of the public [will] be secondary. If quality of goods jeopardizes these payments, then the quality is cut down. If full service cuts into the payments, then service is cut down. This kind of money does not serve business. It seeks to make business serve it. Live money goes into the business to work and to share with the business. It is there to be used. It shares whatever losses there may be. It is asset to the last penny and never a liability. Live money in a business is usually accompanied by the active labour of the man or men who put it there. Dead money is a sucker-plant…. The best defence any people can have against their control by mere money is a business system that is strong and healthy through rendering wholesome service to the community. …and so I (and Henry) have set the scene as to what this ‘story’ is all about – customers, employees and money…and in particular, how do large floating (i.e. short-term thinking) shareholder owned organisations ‘fit’…and most importantly, (how) can their structure be altered to provide a foundation for a long term win/win/win for all?. 1. All of Henry Ford’s quotes above come from his 1926 book ‘Today and Tomorrow’. 2. Ford Success: Just in case you doubt this success (and accepting that money is a poor measure) Forbes estimates that, in today’s money, Henry Ford was worth around US$200 Billion….more than double anyone alive today. 3. Note to self: I’ve still got to write the post that slaughters the ‘Balanced Scorecard’ sacred cow! It’s been on my ‘to do’ list for far too long because other stuff keeps on popping up every day. This post is a bit ‘tongue in cheek’ (so if you don’t agree 100% then please don’t take it too much to heart 🙂 ) but it expresses what I’ve thought for years now. A business fashion started back in, oooh, probably the 1980s – talking about ‘internal customers’ within organisations. The idea being that you are the customer for the person upstream from you – they are producing for you – and, in turn, the person downstream from you is your customer…and on and on…in a long chain from the start to the finish of a value stream. Lots of lovely internal customers. But here’s the thing: They aren’t your customer – they are a part of (i.e. colleagues within) your system! Yes, yes, I know that you are reliant on them and then the next lot are in turn reliant on you…but that’s just because of the design of the (current) method. And, yes, yes, I know that it would be jolly nice if you all worked together in really efficient and effective ways – but that doesn’t make for a customer relationship. Further, it can be harmful to think in this way. The point being that a customer is, by definition, external to the system. Everyone and everything within the system is (or should be) there for them. Without the (true) customer, there is nothing. Why does this ‘internal customer’ label bother me so? Such ‘internal customer’ logic causes us to think that we must do what they ask, and not question them too much, along the lines of the ‘customer is always right’ and ‘give the customer what they want’ mantras. It presents a suboptimal ‘them’ and ‘us’ situation rather than a collaborative horizontal (across the system) ‘we’. Once you think in terms of internal customers, it’s only a short and painful step towards the dreaded ‘Service Level Agreement’ (SLA) game show. Grrrr. A massive risk within the ‘internal customer’ logic is the creation of a static system, one in which the method (and targets) becomes defined in quick drying cement. If I think of you as my customer, then there’s unlikely to be much challenge from me as to whether your role should change, or even exist…and you sure as hell aren’t going to appreciate any such line of reasoning from me – who the hell am I to suggest this – you are my customer, I am merely your supplier! Further, as my customer, you may consider that you know best, that your wish should be my command and that I should be grateful to be of service to you. Indeed, you may even score me on how well I treat you. Ouch! How many of you reading this post have been asked to do something by your ‘internal customer’ and thought that what they were asking for was nuts…and how many of you didn’t get the chance to meaningfully discuss this with them, and had to carry it out anyway? Even worse, how many of you have switched off from even thinking about whether your internal customer’s request makes sense and have merely become ‘order takers’. What a load of nonsense. Let’s just throw the ‘internal customer‘ language in the bin. I can almost hear some HR departments chiding my thinking as being disrespectful to my fellow employees. No, it’s not! In fact, it’s the opposite. I think it’s disingenuous for me to pretend that my work colleagues are my customer. They are far far more than that – we are reliant on each other, to keep our jobs, to grow ourselves, to stimulate each other, to want to come to work…to spend our working lives delivering something meaningful to this world. This is soooo much more than being merely thought of as ‘internal customers’. As colleagues, we need a robust relationship, not one of diffidence and servitude. We need to respectfully challenge each other, work hard to listen to and understand each other’s worldviews…and become better, closer and wiser for this. We are not ‘internal customers’, we are colleagues. I always pick a trusted colleague (from an ever widening group of ‘pioneers’) to have a read of my posts before I press publish. I was particularly nervous about this one as I felt that it could just be me ranting about an ‘issue I have with the world’ (again 🙂 ). This made me giggle. Turning to the wonderful game of rugby, I had visions of the ‘backs’ telling the ‘forwards’ that they are their customers…I don’t think that this would go down too well. the potential receiver considering themselves as the customer of the possible passer of the ball. What a load of guff! They’re a team that have to work together, as equals; that have to understand, and swiftly react, to what’s around them; that have to make the selfless pass or tackle; and that have to pick each other up and genuinely offer words of support when perhaps it doesn’t go quite as desired. They are not ‘internal customers’, they are team mates. 1. I’m not a massive fan of this particular Peter Drucker quote, but it fits for this post. Why so? Unfortunately, businesses have become far too adept at creating customers and, as a result, we have rampant consumerism. I reflect on Professor Tim Jackson (author of ‘Prosperity without Growth’) clearly calling out THE problem for humanity, and what we* might do about it (* requiring brilliant political leadership). His take-away quote “The story about us – people being persuaded to spend money we don’t have on things we don’t need to create impressions that won’t last on people we don’t care about.” Prof. Tim Jackson TED talk. I expect that you’ve heard of the industrialist Henry Ford (1863 – 1947), but what about his massive ‘River Rouge’ car plant? If you had gone for a ‘factory visit’ in the late 1920s, what would you have noticed? Ford wanted to provide a car that the masses could afford to buy – to ‘democratise the automobile’. Enter the Ford Model T – a car designed to be easy to drive and easy to repair, with standard interchangeable parts. …but it wasn’t just about the car’s design. It was about the design of how the car was made. In 1906, Ford’s engineers did something different – they experimented with the physical layout of their manufacturing system. They arranged their manufacturing tools in the sequence of processing steps rather than the normal practise of by machine type. This seems ridiculously obvious now (hindsight is a wonderful thing! ), and the result was considerably higher productivity. This innovation created a flow in the order of the work but, at this stage of the Ford story, each work step was still done on stationary tables and stands. In 1913, they took the next breakthrough step: they experimented with the moving assembly line for a small section of the process and, after some fine-tuning, this increased productivity fourfold…..and so the engineers got to work spreading this method throughout the manufacturing value stream. Ford was constantly reducing his costs, not by ‘cost-cutting’ but through a fanatical focus on creating flow. This was achieved by a combination of continuous (incremental) and breakthrough (step change) improvements…which enabled Ford to pass on these savings by consistently lowering the price of the Model T…which increased demand…which outstripped supply…which meant that ever further production innovations were required to keep up! A great deal of the experimentation explained above was carried out at the purpose built Highland Park factory. It was six-stories high, with a railroad track running down a central atrium (pictured) and cranes lifting materials from the rail carriages up to balconies that opened to the appropriate floors on either side. The basic pieces of the Model T started at the top floor and, through the use of chutes, conveyors and tubes between floors and the force of gravity, they made their way down through the various sub-assembly processes until they reached the ground floor final assembly conveyor….and then the completed car could ‘drive off the line’. Whilst Highland Park was an amazing feat of engineering, it had its limitations – such as the central crane-way that was probably a huge bottleneck! Henry Ford went for one more innovative jump – he created an enormous horizontal factory complex called the River Rouge2. The site started with raw iron ore and materials and finished with completed automobiles. It had its own ship docks, power generation plant, blast furnaces and rolling mills – all arranged to achieve flow (I’ve added the basic flow over an aerial picture). You are probably familiar with the famous Henry Ford quote that ‘you can have any colour you like, as long as it’s black’. Today this sounds quaint, even humorous but there’s a seriously important point within: the manufacturing process was not designed to handle variety. This hadn’t been a problem – people just wanted to be able to afford a car! – but rising standards of living and the birth of modern marketing gave rise to the ‘sophisticated consumer’. The new problem became offering ever wider variety (e.g. different colours, engine choices, trim levels, add-ons….) whilst retaining low-prices (and therefore mass-production costs). And so to the crux of this post: Lots of organisations from all around America and the world went to the River Rouge to learn…but what did they see…and, therefore, what did they go away to do? American Manufacturers post World War II. So American organisations saw scale at the River Rouge. Unfortunately, achieving the product variety now demanded by customers meant regularly stopping the production line to change tooling to be able to produce the different variants. Delivering variety was seriously hindering speed. Let’s build each process to the largest scale feasible, and then run large batches per product variant through at the fastest rate possible and thus keep the number of changeovers required down to a minimum. This fundamentally changed production from workers producing for the next process step to workers merely producing for inventory. It became a case of ‘make lots and inspect later’. It was virtually a crime to stop the line3 – a disaster for quality! Let’s centralise process steps into ‘centres of excellence’ so that we can increase scale even further! We might end up with, say, a massive steel works in one city, huge sub-assemblies in another city and a mega final assembly yet somewhere else. …and the above ‘solution’ to variety introduced massive wastes in the forms of transportation across sites; inventory and its motion as it is constantly transferred in and out of the warehouse; over-production and obsolescence; defects through poor quality and rework…and on and on and on. You could conclude that they ‘unlearned’ (even destroyed) what Henry Ford had achieved before variety had been introduced. ‘management by results’ using managerial accounting data (unit costs, rates of return, targets, budgets,…) to command and control the work. This approach, even though it was hugely wasteful, proved profitable until the 1970s…until domestic demand became satiated and globalisation opened up the market to other manufacturers. Things suddenly became rather competitive…. The Japanese, and Toyota in particular, saw flow at the River Rouge. Japan, unlike America, did not have the luxury of abundant resources after World War II. They couldn’t afford to create huge factories or tie up money in inventory…so they had to find a different way – to do a lot with a little. Taiichi Ohno came to the conclusion that variety and flow had to go together i.e. “a system where material and work flowed continuously, one order at a time” (Johnson). In short, he set his people a huge visionary challenge, of working together as a system to think about the incremental, and sometimes giant, steps they could take to handle variety ‘in the line’. Rather than centralised planning with standardised work dictated to them, the workers were empowered, and encouraged, to think for themselves, to deal with what was in front of them, to experiment and to innovate….and to share what they had learned. And, wow, they came up with some fabulous techniques such as ‘Single-Minute Exchange of Dies’ (SMED), ‘pull’ using kanban, product supermarkets, ‘stop the line’ using andon cords, visual management, machine ‘right sizing’…and on and on. I could write about each of these…but I’m not going to (at least not now). The point is not the brilliant innovations themselves. It is the clear and permanent challenges that were set and the constant progress towards them. The Western (?) ‘solution’ for service organisations has, sadly, been virtually the same – scale: to standardise, specialise, centralise and ‘crank up the volume’. Yet the challenge of handling customer variety is so much bigger: variety for service organisations is virtually infinite – it’s different per customer and, even for a given customer, it differs as their circumstances change. So should we just pick up the ‘Toyota tool kit’ and get implementing? No. The techniques to meet the challenge will differ. Service is NOT manufacturing. But can we learn from Toyota? Most certainly – but this must be at the deepest ‘beliefs and behaviours’ level. The core message from the above is that service organisations should design their system such that the front line are allowed, and enabled, to absorb variety in customer demand. …then you have seen scale, through commanding and controlling the work, as the ‘solution’. …then you are on a similar track to Ohno: Pursuing flow for each unique customer demand, through revealing and harvesting the passion and pride within your workers. Update: Here’s the link to an addendum to this post, which came about from a comment below. Other details (including pictures) come from searching around the ‘interweb’ thing. …and of course the service ending is inspired by the work of John Seddon. i.e. Henry Ford had built this huge production machine but his product had gone out of fashion because its competitor, General Motors, was providing the variety that customers now wanted, albeit using scale to do so. Ford was now in a dash to recover. 3. ‘Stop the line’ crime: Workers knew that managers wanted them to make as many as possible, with no ‘down time’. I understand that this is where the phrase to ‘throw a spanner in the works’ comes from…which refers to a disgruntled worker ‘accidentally’ dropping a tool into the assembly line mechanism so that the line stopped and they all got a break whilst the cause was found and rectified. Oh…so that’s why ‘Command and Control’ doesn’t work very well! Russ Ackoff researched and wrote a great deal about systems. It is within his writings1 that I find an excellent explanation about why many organisations adopted the command and control management model, why there is a major problem with this and, most importantly, why there is a better way. If you have parts but no aim then you don’t have a system…you simply have a ‘collection’. If you have a part that (truly) isn’t required to achieve the aim then it isn’t actually part of the system…which is why your ‘appendix’ body part got its name. The heart and lungs are parts of the body but if they function according to what’s best ‘for themselves’ then they won’t function as required for the overall good of the whole. It’s no good if the brain is telling the heart and lungs to ‘work flat out’ to run like hell from a chasing pack of lions and these organs both respond with a “no thanks, this doesn’t suit us!” The same is true for parts of (e.g. functions within) organisations. You can buy a ‘light as a feather’ carbon frame, an awesome set of aero wheels and a precision engineered 11-speed group set but you can’t ride them as a bike if they don’t fit together. Further, someone with a basic ‘sit up and beg’ bike frame with cheap wheels and components that do fit will easily beat you in a bike race. If you take apart an alarm clock, you will have all of the parts necessary for the system but the disassembled collection of parts isn’t sufficient to tell you the time. The above has huge implications. Ackoff defined a number of types of systems2 and the problems that occur when an organisation adopts a management model that does not match the correct system type. A deterministic system is one which has no purpose and neither do its component parts. This might seem rather strange…”Erm, I thought you said a system had to have an aim? !” – the point is that a deterministic system normally serves a purpose of an entity external to it, such as its creator. Its function, and that of its parts, is simply to provide that service when required. Mechanisms are the most obvious examples of deterministic systems: An alarm clock is such a system. Its purpose (to tell the time) has been provided to it by its creator (the clock maker)….and that is what it is for, nothing more and nothing less. It can’t decide to do something else! Even a computer, whilst incredibly more complicated than an alarm clock, is such a system – it is reliant on the inputs and programs provided to it by its external sources. An animated system is one which does have a purpose of its own but its parts don’t. Animals (and therefore humans) are the most obvious example. They have a purpose of their own – where this might be argued as (at a minimum) survival, and (more optimistically) to enjoy doing so, in the manner of their own choosing. The animal is made up of parts (e.g. organs) and whilst these parts have a necessary function for the good of the whole, they do not have a purpose of their own. In this way we can compare a computer to a person and see that they are fundamentally different. The computer’s purpose is provided to it whilst the person provides their own. A social system is one which has a purpose of its own and so do its parts (the people within). And even more complex, a person belongs to multiple social systems – which have different, sometimes conflicting, purposes3. Okay, interesting stuff but what’s the point? Adam Smith (often referred to as the father of economics and of capitalism) wrote a famous book called ‘The wealth of nations’ (1776). In it, he used the example of a pin factory to explain the concept of ‘the division of labour’. He explained that one person performing all the steps necessary to making a pin could perhaps make only 20 pins a day but if the pin-making process were broken up into a series of limited operations, with separate people performing them in a joined-up line, productivity could rise to thousands of pins per day per worker. Now that sounds fantastic doesn’t it! But for who? Smith’s thinking was taken on board by industrialists who went on to employ vast factories of ‘unskilled labour’ in the new concept of ‘manufacturing’ (and who likely still do in the sweat shops of 3rd world countries). Standing back, we can see that this is using people as replaceable machine parts i.e. we have a defined mechanism (the manufacturing process) which is given its purpose externally by its creator (e.g. make pins)…and wow, this mechanism sure can make pins! such business owners were subject to very little societal controls (such as governmental interventions and constraints) limiting their treatment of their worker ‘parts’4. It’s worth noting that, even though worker conditions were massively in his favour, Ford’s ‘mechanism’ had an astounding 370% turnover of workers in 1913, with new hires staying an average of only 3 months. Many workers simply ‘walked off the job’ without notifying anyone…which is what happens if you ask humans to perform monotonous (demoralising) work without having to use their brains. So times moved on. We had two world wars that caused/ enabled major societal changes – a major shakeup of the class system, the birth and rise of the Labour movement and worker unions, massive improvements in education, social security and welfare, and great advances in technology. The other significant change was the raising of capital (necessary for post war growth and development) from the public and the consequent birth/ rise of publically owned corporations. This separated the ownership and management of these new organisations. the required work had become far more skilled (utilising new technologies). Managers were no longer able to treat workers as merely replaceable cogs in a machine – it took time to train them, and they now had worker rights and choice. Now, rather than seeing an organisation as a deterministic system with the all-powerful owner dictating its purpose (as the likes of Ford had done), they operated as an animated system would6: with a ‘brain’ (senior management) and a ‘body’ (the various operating functions performing the work). Such a model works by senior management providing the instructions (the what: commands) and procedures (the how: controls) and then the operating units carrying them out accordingly. The organisational ‘brain’ thinks that the answer to an increasingly complex environment is simply to increase the quantity and regularity of communication with the ‘body’ parts. This fails to realise that communication is not the underlying problem. But the reality for every organisation is that they have purposeful parts – you and I – whether they like it or not…and so to treat these parts as merely having a function for the whole is to inevitably generate conflict. the humans working within it have separate purposes. …and therefore any management model that doesn’t understand and work within such a social system will be very limiting – causing loss of immeasurable value to the organisation AND to the people within. The rate of change in our world has been massively accelerating. It used to be that change was seen as generational and this made it relatively easy for people to adapt but this no longer holds true. But if survival is desired, then the best chance that an organisation has is to operate a management model that actually fits with the correct type of system! In so doing, it can get the best out of everyone within. What might this model look like? Studying ‘Deming’s 14 points for Management’ would be a great start. A post to follow next. Who’s been successfully operating a social model for decades? Two brilliant examples are Toyota and Handelsbanken. 1. Credit: The core of this post comes from learnings derived from a classic Ackoff essay entitled ‘Reflections on systems and their models’ which can be found in the book ‘Ackoff’s Best: His classic writings on management’. 2. I’m aware that other system thinkers have created other, more sophisticated, classification schemes (e.g. Boulding, Beer). Ackoff’s system types nicely serve the purpose of this post. 4. For those ‘system’ geeks out there: Ackoff explained a 4th system type, that of an ecological system – where the parts are purposeful but the whole is not. Ecological systems contain interacting mechanistic, organismic and social systems, but do not have a purpose of their own. However, their function(s) serve the purpose of the systems that are their parts. Example: the purposeful use of fluorocarbons as propellants by humans (a purposeful part of the ecological system) affects the ozone layer in a way that is determined, and not a matter of choice for our planet (the whole)…the planet cannot decide that it is harmful to it and decide to ‘do something about it’– the outcome (even though we may not understand it) is determined. 5. Henry Ford realised the problem and, in an attempt to compensate for their conditions, paid his workers well as compared to what they could earn elsewhere. 6. Stafford Beer wrote a famous book called ‘The brain of the firm’ (1972) that explored in detail the analogy of an organisation working as the human body does.